A stampede at a railway station in northern India killed at least 36 Hindu pilgrims on Sunday, the busiest day of the world's largest religious festival at which some 30 million had gathered to wash away their sins in the sacred Ganges river. Twenty-seven of the dead were women, mostly elderly and poor. An eight-year-old girl was also crushed to death. A Reuters witness saw a woman weeping at the train station, surrounded by six bodies dressed in brightly colored saris. Up to 100 million pilgrims and Hindu ascetics are expected to attend the two-month long Kumbh Mela festival, which comes to an end next month. It is held every 12 years in a temporary city covering an area larger than Athens, spread over a wide sandy river bank in Allahabad at the point where the Ganges and Yamuna rivers meet a third mythical river. The festival grows in size every time it is held and is considered the world's largest temporary gathering of people. 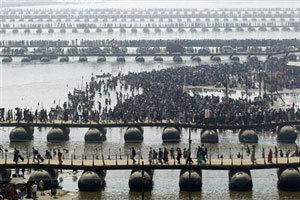 Officials said some 30 million visited the site on Sunday, considered the most auspicious day to bathe in the river. Officials gave contradictory versions of what caused the crush. A railway official told Reuters police had been using batons to control the crowd, triggering panic. A state government official said a footbridge handrail collapsed, sending people slipping down the stairs and starting a stampede. A spokesman for Indian railways said authorities had found 36 bodies and 30 people were injured. The injured were being treated at hospitals in Allahabad. "Since there were huge crowds and a lot of panic, it took time before the bodies could be extricated," said another official, R. M. Srivastava, the top security official in the state of Uttar Pradesh, where the festival is held. Deadly stampedes are common at India's vast pilgrimages and religious festivals. In 2008, 145 people died when a panicking crowd pushed people over a ravine near the Himalayan temple of Naina Devi. Thousands of police and volunteers are used for crowd control during the Kumbh Mela, manning the river bank when the pilgrims and naked, dreadlocked ascetics dash into the water to bathe. The festival has its roots in a Hindu tradition that says the god Vishnu wrested a golden pot from demons containing the nectar of immortality. In a 12-day fight for possession, four drops fell to earth, in the cities of Allahabad, Haridwar, Ujain and Nasik. Every three years a Kumbh Mela is held at one of these spots, with the festival at Allahabad the holiest of them all. More than 2,000 years old, the festival is a meeting point for Hindu "sadhu" ascetics, some of whom live in forests or Himalayan caves and who belong to dozens of inter-related congregations. The sects have their own administration and elect leaders, but are also known for violent clashes among themselves.